The gentleman across the way was wearing the sharpest shirt and trousers I have ever seen. And I do mean sharp! I don’t think that his clothes were starched, or they would have cracked when he moved. 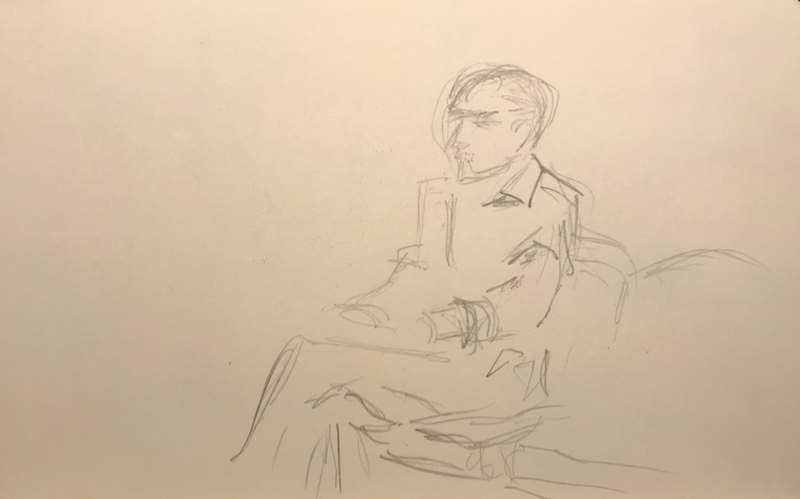 This entry was posted in Personal Stories and tagged art, artistic process, creative process, cubism, drawing, ironed clothes, pencil sketch, portrait, visual art, Waiting Room. Bookmark the permalink. I like your follow-up idea a lot and I’d love to see it, if I may say! Thanks, Claudia. I started it. Not as easy as I thought. We’ll see how it works. Thanks, Kerfe. I’m going to try to implement my mind’s-eye concept. It is proving difficult.